Students returned to Stoneman Douglas High School Sunday for orientation. NBC 6 Reporter Laura Rodriguez explains. 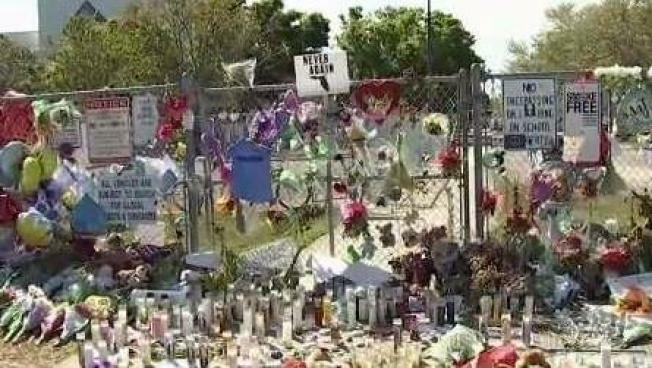 Students, parents and faculty gathered at Marjory Stoneman Douglas High School Sunday afternoon for the first time for an orientation to welcome students back to school since the tragedy that occurred on Valentine’s Day. “We have a good future and the rest of the year ahead of us,” said Jenna Korsten, a student at Stoneman Douglas High. While many are looking forward to going back to school, some are still trying to cope with the return. Some students said Sunday’s orientation gave them that bit of extra strength they needed to prepare for Wednesday morning. “I’ve been very nervous about it, but also, I’m a strong girl and I think I can do it,” said Korsten. Parents were also a bit hesitant to go back to Stoneman Douglas High, however, they say it was a much needed day of support. “I felt a little bit scared when I first walked in, you kind of get this sense of chills,” said Clara Mercury, a parent. “I had like a weird feeling going in there,” said another parent. The only building on campus that was off limits was the freshman building, which was the building where the shooting occurred. Students said they were able to claim their backpacks and items left behind on February 14th. “They were inside boxes, like according to classes and periods and stuff like that, so everyone could find their stuff easily,” said a student. Outside the school, memorials continue to grow, including a 3-mile long lei made by students and volunteers in Hawaii. “The primary symbol is Aloha, which means love. And the other symbol is solidarity. As we weave, we weave our prayers into the lei, we weave our love into the lei,” said Ron Panzo of Lei of Aloha.